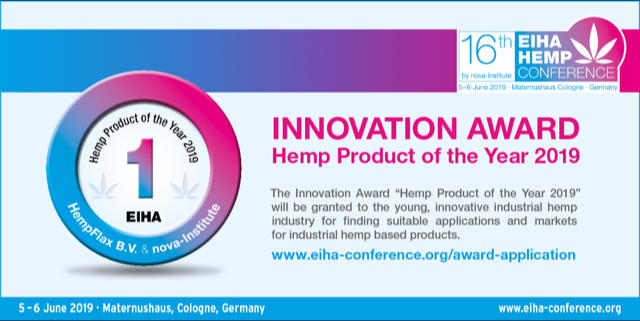 For the second time, the innovation award “Hemp Product of the Year 2019” (http://eiha-conference.org/award-application) will be granted to the young, innovative industrial hemp industry for all kind of industrial hemp-based products. 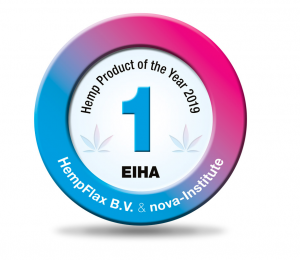 The innovation award “Hemp Product of the Year 2019” is sponsored by HempFlax (NL). Hemp products could be hemp food, pharmaceuticals, textiles, biocomposites, construction, cosmetics and insulation material and many more. The focus of the award is on new developments within these business areas. Producers and inventors of innovative industrial hemp products are invited to hand in their application by the end of April 2019. We have organised various other product awards on biocomposites, bio-based materials and best CO2 utilisation. All were successful and we received great feedback from these companies and they reported a significant boost for their innovation and business after the conference. If you need any other information regarding the application, we are glad to assist you. We appreciate if you could please get back to us by the end of April latest. We look forward to seeing you at the at the 16th EIHA Hemp Conference 5 – 6 June 2019 in Cologne: www.eiha-conference.org. We are expecting 400 international participants from 50 countries – we are looking forward to the biggest event on industrial hemp ever!